Well, I got my KK and started backcombing. It is SO much harder and time consuming that I thought it would be. So far I have only backcombed 12 in about 5 hours (or more). WHY?! I'm sure you get faster and more efficient as you gain experience, but have any of you ever taken THIS long just to backcomb, even in the very beginning of your dread making days? For example, if you look at the one that's on the top layer, second from the left, it doesn't really look backcombed enough on the higher end... I did everything I could. It simply won't fix! Sorry about the photo quality; internal webcam. Thank you I hope they will hold up long enough! I find that I keep going back to some previous ones and backcombing them again out of paranoia. I watched Rivet Licker's tutorial on the loops, but sadly was simply not physically able to backcomb them without any sort of knot first :p So I just tie a simple knot and start backcombing. 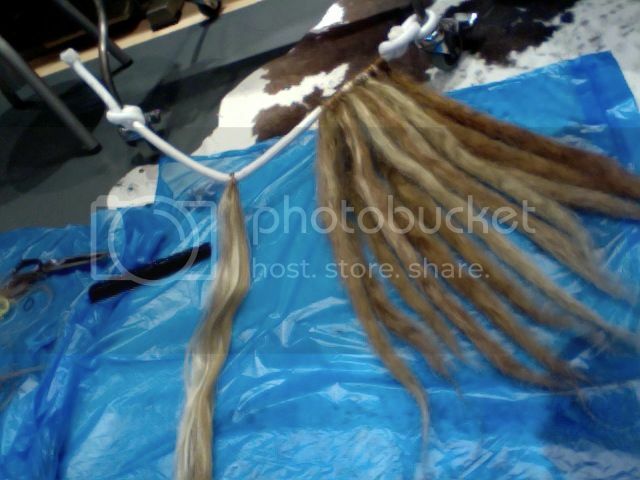 Also, sadly, the first few I made (in the photos) were on a rope I found that was much too thick. I'm assuming there's no way to save the situation now, so I'll just install those in the least visible areas. Thank you! I was getting a little paranoid about their quality and wasn't sure if they would be ok, but ended up proceeding anyway with the same method. They're going to be quite skinny! One final question: Could, say, 70 SEs be enough? :/ They're quite skinny, though. Disregard the last question! 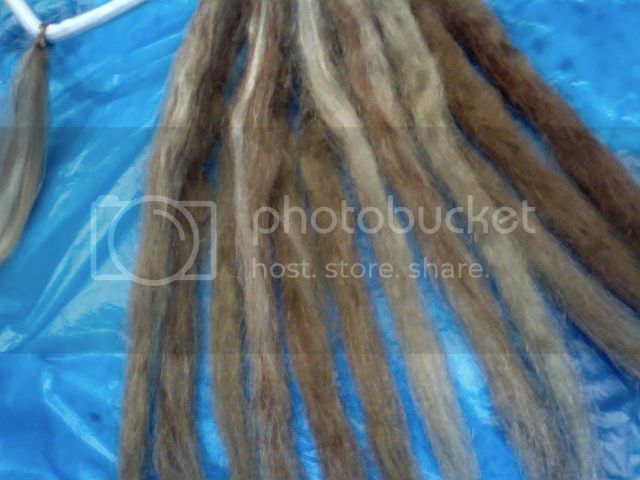 I finally finished 125 dreads. I've sealed about half of them, and they seem ok. I feel like a million people stood in a line and took turns punching me and jabbing thick needles in my back :p WORTH IT. Sort of. I'm finally done! I'll post them in the critique section. I reeeeeeally hope they're backcombed enough and don't fall apart soon! I find with time and a good movie you will have more done that you will realize. I back comb really fast and hard, I think I back combed and sealed around 7 SE dreads in an hour or so earlier. I've made a lot of dreads. You definitely have to have the energy and be in the mood to crank them out though and having a distraction for your mind like a good movie or maybe a marathon of your fave show is great. Time will fly faster! As far as I can see, they look quite alright, specially for your first time! Thanks guys! BambooPanda13, I ended up watching tons of movies and episodes; it was a lot more tolerable that way :p But I frequently had to get up and stretch. My back was in an immense amount of pain. Worth it, though!